Cats like to be clean and do a pretty good job of it and are notorious for their fastidious grooming routine. Nevertheless, there can be times when a little human intervention is required. Unfortunately, very few cats naturally enjoy the water, so many people believe that bathing their cat is going to be a virtually impossible task. However, with the right technique and enough practise, you will be able to make bath time a fun and stress-free experience for you and your cat. Preparation is key when it comes to bathing your cat. By placing all of the necessary equipment within immediate reach, you will be able to keep one hand on your furry friend and use the other to wash and clean your cat. You will need several thick towels, your cat shampoo (and conditioner if your cat is particularly long-haired), a shower spray attachment (if your sink doesn’t have one), large cups for shampooing and rinsing, and a clean sponge. Ideally you should also place a non-slip mat at the bottom of your sink so that your cat doesn’t slide around. Mix a capful of shampoo in a cup full of warm water and mix it well. Then place on the side of the sink so you can grab it easily when needed. A sink is the easiest receptacle to bath your cat in. It is the right height for you to bathe her without hurting your back, and it is small enough to mean that you don’t need to use lots of water and can contain her more easily. Run enough body-temperature water in to the sink to reach up to your kitty’s belly. Make sure you check the temperature on your wrist to ensure it is not too hot or too cold. Gently lift your cat and place her into the water. Reassure her constantly, stroke her and let her stand still, to help her get used to the feeling of the water around her. After a few minutes, turn on the shower spray and let her become familiar with the sound before using it to wet her body. Take care not to spray her directly in the face because this will definitely frighten her. Once your kitty is thoroughly wet, pour the cup of diluted cat shampoo all over her body. Make sure you distribute it evenly and avoid her head and face. Massage it gently into her fur for a few minutes. Many cat owners find that their feline friend actually enjoys the sensation of a full body massage. Soap that is left on your kitty’s skin may actually irritate it, so the rinsing process is an important one. Using the spray nozzle and body-temperature water, rinse the soap away, carefully avoiding her face. Use your hand in long strokes to push the soapy water away from her body, which will also help to keep her calm and relaxed. Once you are certain that all traces of soap have been removed from her fur, you can move your attention to cleaning her face. Soak your sponge in some clean, warm water (no shampoo) and wring it out. Then use the moist sponge to wipe down her head and face, taking care not to touch her eyes, ears or mouth. After bath time is complete and your kitty is clean, lift her out of the sink and wrap her in a towel. Place her on another towel which will help catch a lot of the water, and gently pat her down. The towel you are using will absorb a lot of the water on her fur. Give her plenty of praise while you dry her, and you can even end with a treat! Once her fur is no longer extremely wet, you can let the rest of her fur dry naturally. You may like to return to her later to give her a good brush to remove any loose hairs. 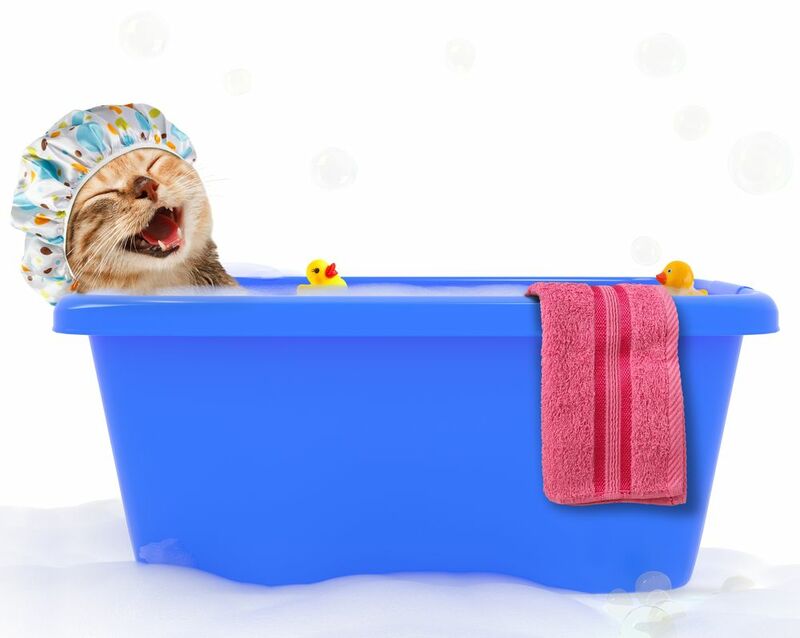 With a little care and patience, bathing your cat needn’t be difficult. Follow these instructions and soon, bath time with your feline friend will be a relaxing experience for you both. For Bridge Park Animal Hospital's grooming services, contact us to schedule an appointment today.